200 x 132 feet on Dearborn avenue, between Schiller street and Burton place, Catholic Bishop to Herbert C. Ayer, $30,000. Archbishop Feehan sold to Stephen & Gale seventy-five feet of property on Dearborn avenue, between Schiller street and Burton place, at $195 a foot. A sale was made last week of property on the Lake-Shore drive in the North Division that is of more than ordinary interest. Mr. George H. Rozet sold for the Catholic Archbishop the entire front on the drive between Burton place and Schiller street, running back to the alley, to Potter Palmer for $90,695. Part of the consideration is the filling of the water lot that has so long been an eyesore in the vicinity. A concerted movement will now be made by Mr. Palmer and the other property owners to fill up all the depressions between State street and the Lake-Shore drive and lift this property into its rightful place as the choicest kind of residence property, not surpassed by any in the city. The Archbishop and the Lincoln Park Commissioners are about finishing North avenue, from Dearborn avenue to the Lake Shore drive. It is the Archbishop’s intention to fill up the property in his charge, grade the streets, and put everything into metropolitan condition. A point worth noting is, that all the filling will be done with sand, and that none of the zymotic stuff that has been so freely used in filling lots in this city will be used. Mr. Palmer has sold 116 of the 580 feet of this latest purchase to Mr. Eugene S. Pike, who will build a residence for his own use there. Mr. Palmer himself will build a home on the northwest corner of Banks street and the Lake Shore drive, where he owns a spacious lot of 151 feet frontage, with a depth of 232 feet. Several other leading citizens will build homesteads in this vicinity. Mr. Palmer has long had faith in the future of the property along the Lake-Shore drive, which he believes will become the finest residence street in the city, and from time to time has picked up eligible corners. He at first selected the southwest corner of Pine and Chestnut streets for a residence. This was then given up for a site farther north, and that in turn abandoned for the corner of Banks street and the Lake-Shore drive. Mr. Palmer is owner of the corner of Bellevue place with a frontage of 108 feet on the drive; 162 feet on the corner of Cedar street and the drive; 80 feet on the corner of Goethe and Stone; 50 feet on the drive, between Goethe and Scott; 80 feet on the northeast corner of Goethe and Stone; 150 feet on the southeast corner of Ritchie place and Banks; 80 feet on the northwest corner of Ritchie place and Banks street; 40 feet on the southwest corner of the drive and Banks street; the lot already referred to, 161x232 feet; on the northwest corner of Banks street and the Lake-Shore Drive, and the latest purchase given above the entire block between Burton place and Schiller street. That part of the North Side which lies between the Water-Works and Lincoln Park, and is east of Dearborn street, is rapidly rising in public favor. This is especially true of the northern half of the district. This is almost virgin ground, and is almost entirely free from objectionable buildings and improvements. Mr. Rozet has sold 80 feet on the northeast corner of Schiller and State streets to J.M. Williams, of Evanston, for $12,400. Mr. Williams will build here. The Archbishop is now breaking ground for his own residence on State street, overlooking Lincoln Park, at the southeast corner of North avenue. He will occupy the block all the way through to Astor street, and will have a frontage of 200 feet on State. The south end of the block is owned by the estate of S.N. Wilcox, which also holds the opposite lots. On the eastern front they will put up a block of elegant residences extending over a frontage of 350 feet. The rest of the east front belongs to Mrs. C.C. Collins, who will erect a residence for herself on her return from Europe. Philip Bartholomao has bought, through Mr. Rozet (Archbishop), 78 feet on the southwest corner of Burton place and State street, and when he comes back from a European trip will put up a house for himself. General Ducat has the adjoining 30 feet on the south. C.T. Wheeler, President of the Union National Bank, is just completing his residence on State street, north of Schiller. The next 50 feet on the corner to the south is owned by General George W. Smith. The 110 feet on the southeast corner of State and Burton place has been sold to people who will build. This statement of recent purchases and of the fine building improvements projected by the buyers will show how brilliant a new future is opening for this part of the North Side. The whole aspect of this long neglected region will be immediately changed by extensive tilling of lots, improvements of streets, and erection of handsome houses. No more of the Catholic Church property will be sold for some time to come. W.D. Kerfoot & Co… sold 50 feet on the east side of North State street, between North avenue and Burton place, and immediately south of the Archbishop’s residence; to John S. Runnells and J.L. Cochran. The 50 feet brought $28,750, of which $15,000 was for one 25-foot piece and $13,750 for the other. Mr. Runnells and Mr. Chochran are to improve this property at once with residences for themselves. Archbishop Feehan, representing the Roman Catholic Bishoprie of Chicago, made a sale yesterday of a part of the square of vacant land abutting on the Lake Shore drive and lying between Burton place and North avenue. In the past he has sold other lots in the vicinity from the church’s holdings, but he never before has consented to part with any portion of the ground directly facing the lake. Victor Lawson is the purchaser, through the agency of Dunlap Smith, securing one of the finest residence sites along the drive – the northwest corner of Burton place. 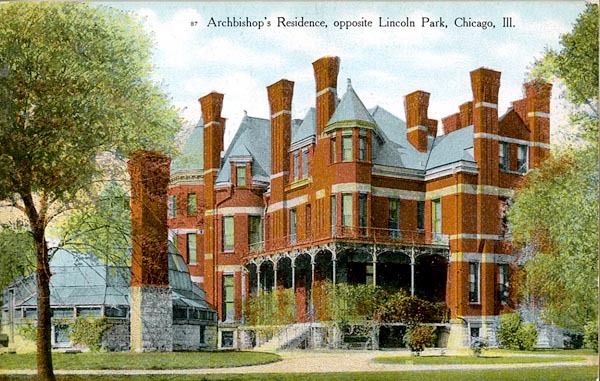 At the diagonally opposite corner of the same tract stands the Archiepiscopal palace, facing Lincoln Park. 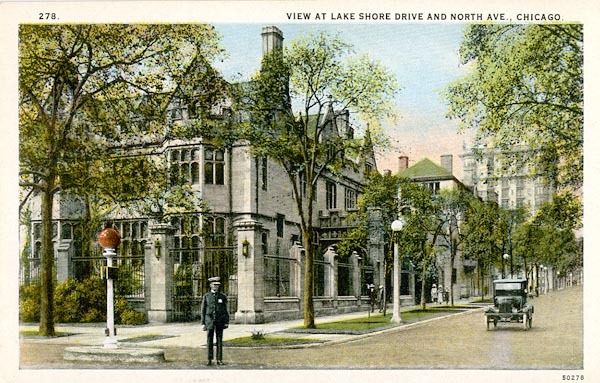 The corner lot sold to Mr. Lawson by the Archbishop has a frontage in the Lake Shore drive of 108 1/2 feet and depth and frontage in Burton place of 168 feet. The transaction calls for a sixteen-foot alley on the west boundary line. The price paid for the property was $125,000, or about $7 a square foot. When Dunlap Smith was given a commission by Mr. Lawson to secure him one of the best sites on the Lake Shore drive there seemed little possibility that he would succeed in securing a corner of the property in Archbishop Feehan’s block. The completion of the purchase is followed by the statement that not another foot in the block is to be had at any price. A close adviser of the Archbishop said yesterday that it would not be many years before property in that section of the city would double in value, and it is said to be the purpose of the Archbishop to hold his other property there, for the present at least. Mr. Lawson for a long time has regarded as desirable the locality in which he has just purchased a building site. Some time ago he bought a lot at Astor and Banks streets. He now lives at 317 La Salle avenue. The rapid growth of Chicago in 1859 encroached on this district, and the Catholic Church selected a tract of land further north, which also bears the name of Calvary. Then began the task of shifting the ashes of the dead to the new location. It was several years before this work was completed. The artisan and the builder soon found their way into the district, however. The turning of the City Cemetery into Lincoln Park and the improvement of the streets made this district a favored one. The Roman Catholic Archbishop has held the title continuously to that part of the old cemetery tract abutting on the park and the Lake Shore drive. The announcement made last summer that a large frontage of Astor street property between Burton place and North avenue had been placed under contract from Archbishop Quigley to David R. Lewis and others, involving also a piece of central business property given in exchange, is now followed by the statement that the deal has practically been closed. Altogether 475 feet of frontage on Astor street was involved, 275 feet on the east side and 200 feet on the west side. In exchange the bishop accepted the property at 93-97 Dearborn street, 58x80 feet. Improved with a five story and basement building. This was valued at $276.600. The archbishop assumed an incumbrance of $115,000, which would leave a value of $101,600 for the Astor street property, which is at the rate of $350 a front foot, the figure announced last summer. As was announced last summer, the purchase of the property was largely due to reports that it was to become the site of a large Catholic Institution, and also that a big apartment house project was in contemplation. It was to prevent this and preserve it for high class residence purposes, that its acquirement was decided upon. Victor F. Lawson was also interested in the deal, having purchased from the archbishop 100x100 feet, west front, on Astor street, for $40,000. He also purchased 15x173 feet east frontage on the Lake Shore drive for $15,000, giving him 157 feet frontage on the drive. It was announced a year or more ago that he was about to improve his frontage on the drive with a handsome residence, but the construction was delayed, it is said, because of reports as to the reported building projects contemplated mentioned above. A notable deal of the week and of special interest as marking the highest price ever paid for vacant residence property in Chicago was the purchase by Richard T. Crane Jr. from the Catholic bishop of Chicago of the property at the southwest corner of Lake Shore drive and North avenue, directly south of Lincoln Park. The lot fronts 85 feet on the drive and 168 feet on North avenue, and while only a nominal consideration was given in the deed it is understood that the price paid was $102,000, which is at the rate of $1,200 a front foot. The lot is regarded as being probably the finest residence property in Chicago, and while the price paid is a steep one it is not generally regarded as excessive when it is considered that Victor F. Lawson paid at the rate of $1,152 a front foot for 142 feet at the northwest corner of the drive and Burton place, also bought from the Catholic bishop. For fifteen feet additional frontage subsequently acquired Mr. Lawson paid at the rate of $1,000 a front foot. The further fact that the 375 feet of frontage between the holdings of Mr. Crane and Mr. Lawson, which also belongs to the Catholic bishop, is to be reserved exclusively for residences of the highest grade, apartment houses being absolutely barred, adds materially to its value. It is Mr. Crane’s purpose to improve his lot with an exceedingly handsome residence, although this may not be done for a year or more. Its cost will be around $123,000. Cremin & O’Connor represented the Catholic bishop in the transaction while Robert F. Shanklin represented Mr. Crane. This is the second large transaction in this addition during the last year, the previous one having been the sale last November of 475 feet of Astor street frontage between Burton place and North avenue to a syndicate headed by David R. Lewis for $161,000. It went in part exchange for the property at 93-97 Dearborn street, valued at $276,600. Mr. Lawson acquired 100 feet of this frontage on the east side of Astor street in the rear of his Lake Shore drive property. The northeast corner of Burton place, with a frontage of 57 feet, and 135 feet at the southeast corner of Astor and North avenue, are the only holdings left to the bishop along that street. The total amount realized from the sales in that block by the Catholic bishop amount to $427,184. with nearly that amount of property left. It has been in the possession of the archdiocese for nearly fifty years, and its original cost was little more than nothing. The Chicago Title and Trust company is trustee in a loan of $100,000, five years, at 4 1/2 per cent, to the Catholic bishop of Chicago secured by 285x110 feet vacant, east front, on Lake Shore drive, 125 feet south of North avenue, and 135x110 feet at the southeast corner of Astor street and North avenue. 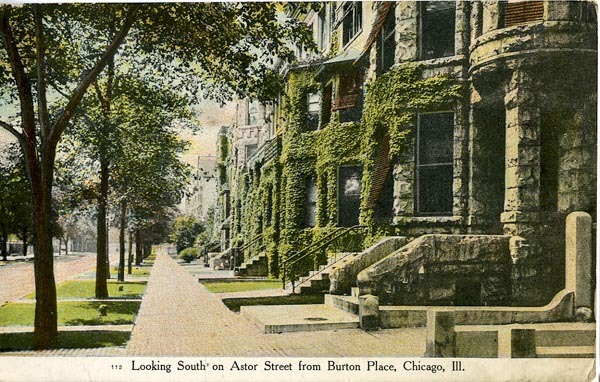 Astor Street – Vacant property at the southeast corner of Astor street and Burton place was sold by the Catholic Bishop of Chicago, through Cremin & O’Connor, to Joanna and John L. Fortune. It has a frontage of fifty-five feet in Astor street. The consideration given in the deed was $10, but it is understood the actual price was $35,000, which is at a rate of $600 a front foot. The property will be improved with two handsome residences costing about $60,000, the construction of which will begin at once. The purchase by Thomas C. Dennehy from the Catholic Bishop of Chicago of the 45 foot lot on Astor street, 50 feet south of North avenue, on the east side of the street, leaves unsold only one 50 foot lot in this valuable subdivision. This is the 50 feet on the corner of North avenue. A consideration of $1 is given in the sale to Mr. Dennehy, but the actual price is said to be $27,000, which is at the rate of $600 a front foot. It is understood that Mr. Dennehy plans to improve the lot with a handsome residence for which he has had plans prepared. Cremin & O’Connor, who were the brokers in the deal, have handled the sale of the Sub-division. Isadore S. Blumenthal attended to the legal details of the transaction. The exclusive Astor street residential district is to have another new residence. It will be located at the southeast corner of Astor street and North avenue, which has been purchased from the Catholic bishop for $83,000, which is at the rate of $700 a front foot for the 50x110 feet of ground. Title was taken by Robert C. Newton, department manager of Swift & Co., but the real purchaser is Gustavus F. Swift Jr. of 2904 Prairie avenue, who will improve the lot with a beautiful residence. The archbishop’s house is on the opposite corner. Cremin & O’Connor were the brokers in the deal, and the transaction has a special interest because it marks the sale of the last Astor street lot in the archbishop’s subdivision and leaves only 260 feet of unsold frontage remaining of the original subdivision. This is located on the drive, between the residence or R.T. Crane Jr. and Victor F. Lawson. Negotiations practically closed in the last week mark the final passing of the Catholic bishop of Chicago of the entire unsold frontage on the highest priced residence block in Chicago – that between Burton place and North avenue, on the Lake Shore drive. The purchasers are Chauncey Keep, multimillionaire and one of the trustees of the Marshall Field estate, and Frederick D. Countiss, a member of the firm of S.B. Chapin & Co., stock brokers. Each has acquired 75 feet, having a depth of 168 feet, for which they paid at the rate of $1,000 a foot, a figure at which all the inside property in this block has been sold. The respective holdings in the order of ownership are: Victor F. Lawson, 142 feet at the corner of Burton place; Edward T. Blair, 50 feet; Mr. Countiss, 75 feet; Mr. Eckhart, 60 feet; Mr. Keep, 75 feet, and Richard T. Crane Jr., 165 feet at the corner of North avenue. Mr. Lawson and Mr. Crane have constructed attractive and costly residences and if the other owners maintain the same standard, as they are likely to do, the block, with its magnificent lake view and drive, will take its rank as one of the most beautiful residence blocks in the world. Cremin & O’Connor represented the Catholic bishop in all the transactions. Mr. Lawson and Mr. Crane are understood to have paid around $1,100 a front foot for their corner holdings. Both Mr. Keep and Mr. Countiss reside on the south side, the former at 2825 Prairie avenue and the latter at 2022 Michigan avenue, and their prospective change serves to illustrate in a striking manner the passing of this one time exclusive south side residence district because of the gradual invasion of business. A few months ago Mr. Keep purchased a site on Astor street with the purpose of ultimately building an making his home there, but the acquirement of the property on the drive has changed his plans. In 2002, the property occupied by the Cardinal's estate was estimated to be worth $15 million. The following year, the house at 1435 N. Astor Street (between Schiller St. and Burton Pl.) was listed for sale at $22 million - the highest priced offering in Chicago's history, according to a December 7, 2003, Chicago Sun-Times article. Vintage postcard, no postmark, title on back: "View at Lake Shore Drive and North Ave., Chicago." Printed text on back: Lake Shore Drive extends south along the eastern part of Lincoln Park parallel to the mile-long lagoon, which contains all kinds of small craft. From the south entrance of the park the Drive skirts the Lake Front and on the left are some of the most beautiful residences in the City. On the right is a shaded bridle path, and beyond a gentle sloping beach with great blocks of granite as a protection from the storm waves. This view is likely looking south from Schiller Street to Banks Street. The Potter Palmer "castle" appears in the distance. 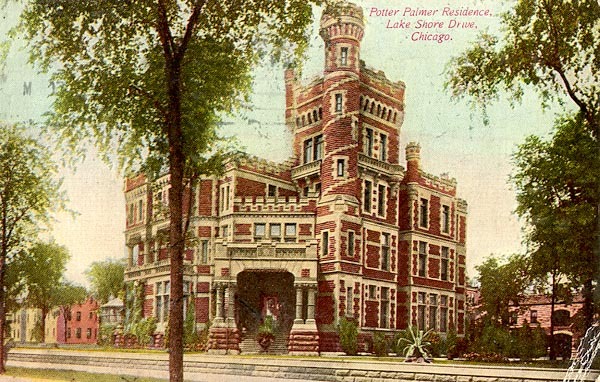 The Potter Palmer residence, which became known as "the castle", was built during the same period as Archbishop Feehan's mansion. The house was finished in 1883, the year after Palmer acquired the entire block from Burton Street, north to Schiller Street, from the Catholic archbishop for $90,695. Vintage postcard, not postmarked, but printed prior to 1910. The Archbishop's estate covers the same grounds as originally laid out. The residence's official address is 1555 State Parkway. The image, above, a view looking south west from Astor Street, represents the back of the building. The estate grounds are visible in the map, below. Robinson’s Atlas of the City of Chicago (detail), courtesy of the Chicago History Museum. See entire map. 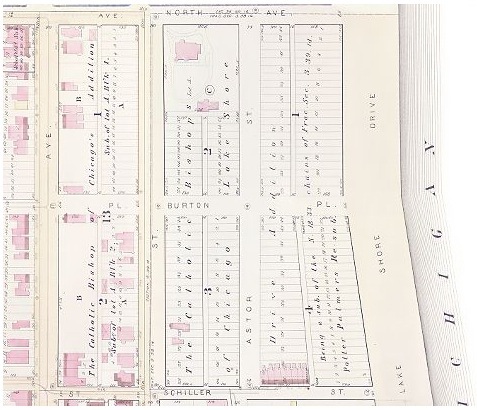 This 1886 plat map detail shows the full coverage of the Catholic cemetery that went to the lakeshore, or approximately just east of where Astor Street appears, above. 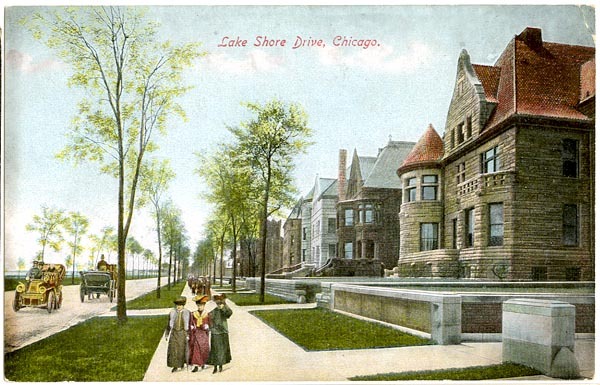 The land further east of Astor Street was built out by the Lincoln Park Commissioners to construct the new Lake Shore Drive. The Archbishop was then able to grade and survey the landfill and sell the newly acquired grounds. As the plat, above, shows, lots have been sub-divided, but very few structures occupy the landscape. The original 1846 plat map of the cemetery covered the the area on the upper left sixth of this 1886 rendering. Google SatelliteTM map. See a broader and interactive satellite map by clicking on the image. The satellite image, above shows the Cardinal's mansion occupying the same ground as in the original plat. 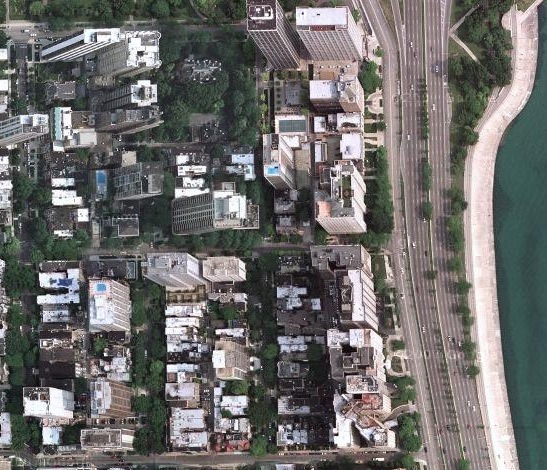 The streets running vertically from the left are Dearborn Street, State Parkway, Astor Street and Lake Shore Drive. At the top of the image is North Boulevard, in the middle is Burton Place, and at the bottom is Schiller Street.